The current featured article in ANS is titled “The Usability and Acceptability of a Patient-Centered Mobile Health Tracking App Among a Sample of Adult Radiation Oncology Patients,” authored by Susan D. Birkhoff, PhD, RN; Mary Ann Cantrell, PhD, RN, CNE, FAAN; Helene Moriarty, PhD, RN, FAAN; and Robert Lustig, MD, FACR. The article is available at no cost while it is featured on the website! In speaking about this work, Dr. Birkhoff emphasized how important it is for nurses to be involved in designing, creating, and evaluating digital tools. Nurses, she believes, have a rich perspective on what patients need, arising from their close relationship with patients. Her work reported in this article arises from her realization that existing digital tools lack the perspectives that nurses bring to healthcare. In this video, she speaks to her experience conducting this study, and why it is important. management and achieve the highest quality of life possible while managing a serious life-limiting illness. In support of this aim, and as part of my doctoral studies, I began researching how nurses attain competence in palliative care nursing. I discovered that there was a gap in the literature related to palliative care nursing theory, and determined that a concept analysis of palliative care nursing (using Walker and Avant’s methodology) was needed. I believed a concept analysis was the best way to identify the antecedents of palliative care nursing competence, as well as to clearly describe the nursing behaviors that demonstrate that palliative care nursing competence is achieved. This concept analysis is very timely considering the American Association of Colleges of Nursing’s (AACN) January 2016 release of 17 Competencies and Recommendations for Educating Undergraduate Nursing Students (CARES) for Preparing Nurses to Care for the Seriously Ill and their Families. This concept analysis fills an international knowledge gap in the theoretical understanding of palliative care nursing, which currently limits the potential for nursing education and research in this area. 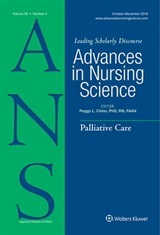 Establishing a clear understanding of how palliative care nursing competence is developed and translates into practice holds value for nurses who implement this important care, nursing educators who must prepare these nurses to meet the AACN competencies, and researchers investigating palliative care nursing practice.